Filial obligation, described as culturally-defined rights and duties that prescribe how family members are expected to care for and provide support to each other, is an important variable that influences older immigrants’ preferences for living and care arrangements. 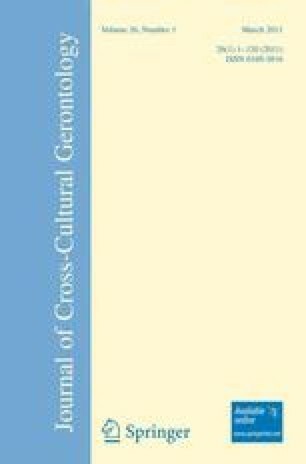 This exploratory study examined variables associated with expectations of filial obligation among middle-aged and older, Asian Indian, first generation immigrants and explored the relationship between variations in expectations of filial obligation and expressed preferences for future living arrangements. Data were collected through telephone surveys of 226 English-speaking immigrants in Atlanta, GA. Although no significant relationships were observed between filial obligation expectations and length of residence in the U.S., respondents indicated a variety of preferred future living arrangements. Contrary to current living arrangement patterns found among older immigrants, very few respondents preferred to move in with their children. The most popular preference was to “move closer to children,” followed by “moving to a retirement community” with the majority preferring a retirement community geared to Asian Indians. Other preferences included “not moving” and “returning to India.” Variations in expectations of filial obligation, length of residence in the U.S., and self-rated health were significantly associated with these preferences. Implications are discussed for building capacity within ethnic communities to address living arrangement preferences and their repercussions for caregiving in ethnic families and in communities. This study was funded in part by grants to Dr. Diwan from the National Institute on Aging (T32-AG0017 and RO3AG19049).